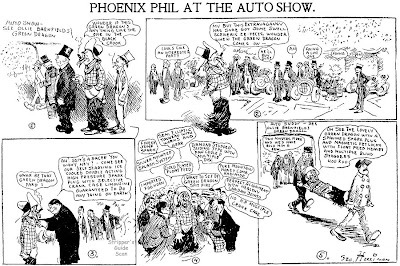 Herriman's cartoons of January 23rd and 24th cover the annual auto show, a very big draw in 1907 when the contraptions were still a comparative newcomer to the nation's roads. Good to know that car salesmen haven't changed much in a hundred years, though. 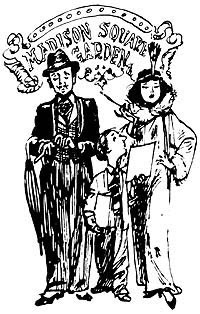 By the way, the subtitle "A Fable Without George's Aid" refers not to Herriman but to the George Ade vernacular humor series "Fables in Slang". On the 25th Herriman takes a break from the auto show to rip into LA Gas once again, and now he's come up with a gorilla to represent the company. 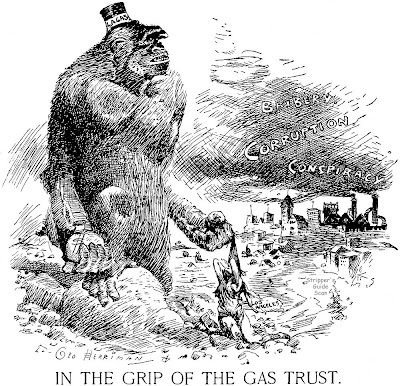 An accompanying editorial indicates that the LA city council is whitewashing the situation, deciding after testimony that LA Gas is doing the best it can; thus the charges of corruption and conspiracy in Herriman's cartoon. My father was a house painter. My mother was a cook for a private family. My father did some painting for this private family. That's how the old man and the old lady met. (When I was a kid, all the kids referred to their par­ents as the old man and the old lady.) I think they got married. Anyhow, I was born in a tenement at 83rd street and Avenue A, which is now York Avenue in New York City. When I was about three my family moved to 85th Street between Avenue A and First Avenue. We lived in a cold water flat. In fact I lived in a cold water flat until my late teens. I spent all my boyhood in 85th street. I attended P. S. 77 at 86th street and First Avenue, which is still there. I hated school, but still to this day I remember the names of all of my teach­ers. They were all witches and bats and ogres. My time when I was not attending school was spent in the streets. My recreation was spent in many diverse ways. Gang fights with kids from neigh­boring streets. Stealing potatoes from vegetable stands and roasting them in tin cans which swung by a wire. Play­ing stick ball which is a sort of baseball, but played with a broom stick and ten­nis ball. Sometimes the ball would be hit into a cellar. One or two of the older kids would run down the cellar after it and spend some time in findingit. The reason, some of the girls would run down the cellar at the same time. I was a little young to know what they did there. In fact I very rarely played ball because they realized I was a lousy player. We also played shinny, which is similar to polo without horses. It was a matter of hitting a flattened tin can with a stick from one goal to another. The goals were manhole covers. In the sum­mer we went swimming at the foot of 89th street and the East River. For a change of scenery, we would take trips to distant parts. This consisted of hitching on trucks down First Avenue to about 34th street. Then doing the same thing back to 85th street. Occasionally, we would venture up to Central Park. Everything was horse-drawn at that time. Election night we would build a big bonfire in the street, from wood which we collected a month before. On Halloween, flour would be put into a stocking. Then we would sock the girls with these weapons. Thanksgiving we masqueraded in our parents' clothes and went from house to house to collect pennies. I had a large collection of cowboy, animal, baseball players, prizefighters etc. pictures which were distributed in cigarette packages at that time. Today they are collectors items. On Saturdays and Sundays I would attend the silent movies whenever I could dig up a nickel. The movies-that was my am­bition then. 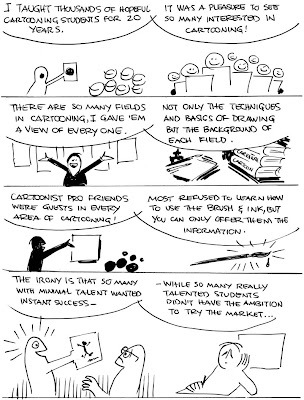 Cartooning was so far away, even though I drew like every kid does, but I never thought of it as my life work. No, I wanted to be a movie actor. Alas, that ambition never materi­alized. At 14 I graduated from public school. That summer I worked at my first job. It was in a drug store. I did everything - mopping the floor, cleaning chande­liers, dusting medicine bottles, chop­ping, wood, running errands, filling bot­tles with some bug killing liquid, call­ing for people to notify them they were wanted on the phone in the drugstore. I worked from 8 to 6, six days a week, for which I received four dollars. After summer vacation I went to Stuyvesant High School. I attended there for two years. The first year I attended afternoon classes. The second year I attended morning classes. It was then that I obtained one of the nicest jobs I ever had. It only lasted a week. At that time there was a motion picture bazaar to be held at the old Madison Square Garden on East 26th street. All of the movie companies had exhib­its there. The day the thing opened, they had a parade with some movie stars. It started uptown and I followed it to the Garden. I hung around out­side for a while when a man approached me and asked me if I wanted a job. It was a job selling programs of each day's activities. So there I was every after­noon and evening for one whole week among such stars as Mary Pickford, Maurice Costello, Anita Stewart, Earle Williams, Theda Bara, and many others. After that all jobs were repugnant to me. After I left high school I had to help support the family. So it was one job af­ter another from then on. Shipping clerk, packer, dish washer, errand boy, office boy etc., etc. I was 18 years old when I realized that becoming a movie actor was far out of reach. So, liking to draw, I de­cided to look for a job in that field. I applied for a job doing lettering on college pennants. I was fired after two weeks. Then I applied for a job doing movie titles. I was fired after two weeks. Then I applied for a job painting forget-me-nots and other flowers on baby rat­tles. At last I made good. I held that job for four years. In the meantime I attended the Art Students League here in New York. I went there in the evenings. The only class in which there was a vacancy was a class instructed by a John Sloan. I never heard of him, but he turned out to be a wonderful instructor. Sloan was a fine arts man and he imbued all of his pupils with the idea of doing just the fine arts. He was prejudiced against all commercial art. He felt that it was better to work for a living as a plumber or in a laundry and to work at fine art in your spare time. [a hypocritical attitude since Sloan spent years living off the proceeds of his Sunday puzzle cartoon feature done for the Philadelphia Press - Allan] I became imbued with this idea, so I decided that I was going into the fine arts. I hated the idea though of working as a plumber or in a laundry. Anyway, these were happy years for me. I enjoyed the spirit of cameraderie of the League. After five years with Sloan and in a slack period of baby rattle painting, I decided to do something with the many drawings that I made during these years. I consulted the classified telephone book and jotted down the names of a number of publications. I took a hand­ful of drawings and started to call on these publishing houses. I started at the Battery and worked my way uptown from there. The following day I Started from the street where I left off the pre­vious day. My first break came at 34th street. It was a publisher of cheap pulp magazines, cowboy stories, etc. They liked my stuff and gave me a story to illustrate. I received seven dollars for my first published drawing. From then on I decided to become a cartoonist. Many of the articles in this newsletter paired different artists and writers in the articles, a charming idea I think. The Soglow article does not seem to have been part of a series (but yes, it certainly does end abruptly). This was a treat; thanks for sharing this, Allan! The "Don Winslow" comic strip, previously syndicated by Bell Syndicate, transfers to General Features Corp. Aug. 4. Begin­ning with the Aug. 18 release a new story line makes it an "all service" strip instead of the pre­vious strictly navy affair. Winslow becomes the "Ace Intelligence Of­ficer of the Department of De­fense." Creator of "Don Winslow" is Frank V. Martinek, assistant vice-president of Standard Oil Co. (Ind. ), Great Lakes district chair­men of the Oil Industry Informa­tion Committee, former Chicago newspaperman, naval intelligence officer and special F.B.I, agent. In 1972 the Chicago Tribune was in the first stages of a bloodbath on the comics page. In 1972-73 they dumped Terry and the Pirates, Smokey Stover, Little Joe, Smilin' Jack, Aggie Mack and other funny page veterans. These strips were put out to pasture as a crop of new hip replacements were tried out (and I'm truly sorry for that pun, it just slipped out). Among the new crop of with-it comics was Doug Wildey's Ambler. The titular hero was a successful folk singer who spent his time drifting around the country righting wrongs and helping those in need. Try to imagine a combination of Easy Rider and Mary Worth and you'll have Ambler pegged. 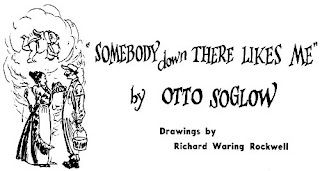 The stories are utterly silly, earnestly trying to capture the flavor of youth in a comic strip penned by a middle-aged man -- a bad idea that was executed over and over in the 60s and 70s. Ambler is certainly no classic, but the Doug Wildey art at least makes the feature quite pleasing to behold. For an excellent capsule bio of Wildey see this site. In a rare case of critical myopia, Ron Goulart in The Funnies says "Wildey, not a first rate illustrator, relied heavily on photo swipes for many of his panels. His far from masterly inking gave Ambler a muddy, blurred appearance." Wildey did use photo references, of course (how many illustrators don't?) but there's nothing muddy about the strip that isn't due to bad newspaper printing. Wildey was experimenting with the use of a lot of tone in the strips, but when decently printed these strips really stand out as a cut above the other straight continuity strips. The strip ambled out of the starting blocks on October 16 1972 as a daily strip, with the Sunday apparently added a month later, on November 19. It never caught on at all with newspaper editors and just squeaked past its first birthday. Ambler became roadkill on December 29 1973 with the final Sunday on December 23. Adventure Feature Syndicate tried to resyndicate the feature to newspapers in 1994 but there was, not too surprisingly, little interest in running a badly dated hippie strip 20 years after the fact. I've read a lot of comic strips and the dismissal of this one always makes me wonder just what "genius" strips they were reading to toss this one on a garbage heap? 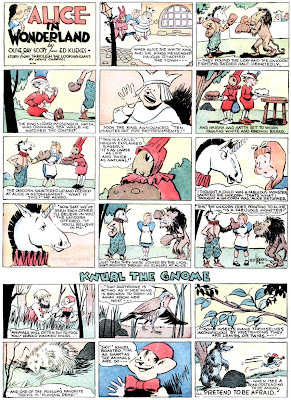 For me this strip failed for two reasons and the first was almost all the action drama strips were getting the heave-ho (readers were apparently too cynically fashionable to read "lame" strips like Prince Valiant or Buzz Sawyer, two strips repeatedly known for quality but had low numbers of readers and saved far longer than others because of their legacy status). Also, while some of this seems dated today it had dialog and story plots that were similar to any number of good television serial action shows from Hawaii 5-0 to The Rockford Files. So, I'll have to disagree with the clever denouncements. I read Ambler along with Doonsebury and Dondi and others and enjoyed it quite it bit. And when compared to the large number of comic strips today that are witless drivel this was very entertaining and gorgeous. As for the "swipes" that are attributed to Wildey's art, well, I don't expect the critics to get this but as an artist I know how photo references help to cut down the time required to draw new characters from scratch and it also keeps the work from looking exactly the same every week. While other artists pride themselves on their lack of "swiping" they also have a short list of characterizations to deploy. After a couple of months their character reference style's been used up so the new character in their strip has the same face as the last guy but with different hair, nose, wears glasses, etc. That works but it gets boring, especially in comic strips. I'm going to make this short because you'll find no dearth of reviews for this bestselling biography of Charles Schulz (including an astounding 70-some reader reviews on Amazon). I only wish Michaelis had done the same -- keep it short, that is. I have no objection to long-form biography -- you've read my appreciative review of R.C. Harvey's Milton Caniff bio - but the way these two books approach their subjects are polar opposites. Unlike the typical Peanuts fan, whose interest is probably more in learning what made Schulz tick, I'm looking for historical context. Harvey provided that for Caniff in great heaping gobs, while Michaelis' obsession is his psychoanalysis of Charles Schulz. Yes, we do get a reasonably detailed biography of Schulz and his strip herein, but that plays second fiddle to the constant drumbeat of skeletons from the closet of Schulz's private life, his obsessions, neuroses and Michaelis' analysis of same. And if you doubt that Schulz was a profoundly unhappy man, a cartoonist whose incredible success was a product of his own inner turmoil, Michaelis proves his case beyond a doubt. The public face of Schulz is not the man you'll meet here. If you loved Peanuts without seeing past the thin veneer of humor you will certainly have a much deeper appreciation of the dark side of the strip and its creator after reading this book. But enough. As I said, I'm going to limit my remarks to a blog audience interested in cartooning history. If you come to the book looking for that you will be disappointed. Michaelis is no cartooning scholar by a long shot. You'll find that out pretty quick when the author mentions some of Schulz's cartoonist heroes, including Winsor McKay. There aren't many egregious errors like this, but its only because the author rarely speaks of other cartoonists or the craft and business of cartooning. Another instance that jarred me was his comment that "not since Beatrix Potter" had an artist chosen to exert serious quality control over the spin-off souvenirs associated with their characters. Walt Disney ring any bells? How about Johnny Gruelle? Grace Drayton? Another instance -- Michaelis pronounces that Snoopy was the first case of an animal taking over a "human cartoon". First of all, Snoopy did not take over the cartoon except as a marketing image, and second its not the only instance. One that comes to mind is the Mutt & Jeff companion strip "Cicero" which became "Cicero's Cat". Another candidate might be "Hem and Amy", which Frank Beck discontinued and then reworked as a long-running dog strip, "Bo". No doubt I'm forgetting others. My point isn't to needle Michaelis for his lack of research in anything other than Schulz -- again, that's not his interest. It's merely to give fair warning that if your appetite runs more toward the R.C. 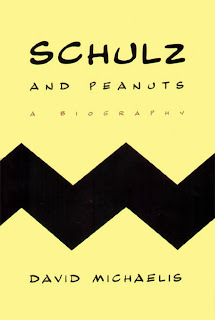 Harvey style of biography then you'll be sorely disappointed with "Schulz and Peanuts". From the pen of the very talented Ed Kuekes we have his only syndicated strip (though a panel, Do You Believe, languishes yet on our mystery strip list). Alice in Wonderland probably takes advantage of the less stringent copyright laws of the day to appropriate Lewis Carroll's world famous character in this Sunday strip adaptation of her adventures. The adaptations were written by Olive Ray Scott, of whom I am perfectly ignorant, and syndicated by United Feature Syndicate. 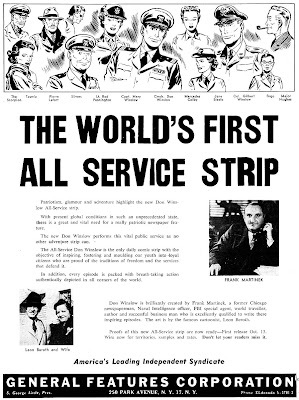 The original run of the strip seems to have been from July 15 1934 to June 23 1935. However, United only advertised the strip in E&P in 1936-38. I'm pretty certain the syndicate was just marketing the series in reprints then, but why they didn't advertise it in 1934 and '35 is a bit of a mystery. The strip was accompanied by a delightful topper titled Knurl the Gnome, which as far as I know is not part of the Carroll canon. It accompanied Alice for her complete run. An Alice in Wonderland book series by Scott and Kuekes was published in France by Hachette in 1937-38. I haven't seen any of the books in person so I don't know if they are reprints of the strips or something different. As far as I know no reprint books were published in the U.S. The Gnome looks a lot like Walter Scotts Little People. Didn't he have an early version of those in the thirties as well? 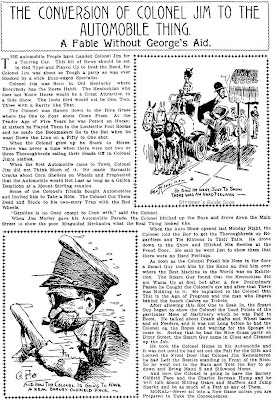 Hi Ger - I imagine you're thinking of Scott's "The Doonks", which usually ran on the same page with Kuekes at the Plain Dealer. Hm... I wonder if they thought these up together or if they both got them from the same source. Especially that weird little hat they have. While it's true that copyright terms were shorter back then, the Alice in Wonderland property was already pretty old when this strip debuted. Alice's Adventures in Wonderland was published in 1865 and Through the Looking Glass in 1871. This strip didn't debut until 63 years after the latter book was published. In today's Disney-influenced copyright law, a 63-year old Alice would still be safely wrapped in the protective cover of the little circled-c.